It's about time. 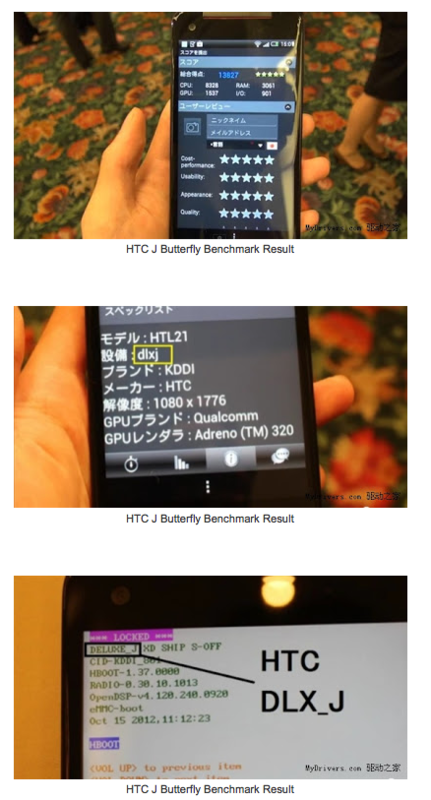 The HTC DLX has most often been rumored carrying a Verizon-style 6435LVW or Droid Incredible X name, and yet it was unveiled first in Japan as the J Butterfly; we really needed the photos just now surfacing at Android Central to remind us that the 5-inch, 1080p gigantophone could still come to Big Red. While nothing's confirmed yet, the black-with-red-trim design and all too prominent Verizon labeling make a convincing case for the DLX's ultimate US destination. A helpfully provided phone profile screen might be more interesting to some, as it hints that we might get the same quad-core Snapdragon S4 Pro, 2GB of RAM and 8-megapixel rear camera as in the J Butterfly -- Verizon won't pull a Droid Incredible 4G LTE and tone down the hardware, if this is true. Without any more details, we're still left wondering just how soon Verizon could commit to launching the smartphone. There's no guarantees that Verizon will follow KDDI's schedule and ship in early December. Update: We've been wondering whether the odd name was meant to be short for Droid Incredible X, i.e. "DIX" instead of "DLX," but our friend @evleaks on Twitter just showed us a list of device PIDs that mentions the latter. @evleaks also suggests that DLX might be short for the codename "Deluxe" for the international variant, just as "ENRC2" was short for "Endeavor C2" (One X+). Update 2: It turns out the J Butterfly has the codename "Deluxe J" in its bootloader menu, so there you have it. Thanks again, @evleaks!